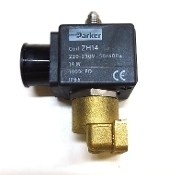 Parker 3 way Solenoid Valve 230V for side mount. Use for Gaggia semiautomatic models Classic coffee & all Baby Gaggia models. VE108BV - drain ø 1/8" conical - max 10 bar; VITON seal - orifice ø 1.5 mm; with coil 14W 220/230V 50/60Hz. fluids temperature -10°C+140°C.